Another announcement from our mate Merv at the Bank of England. There are strong headwinds ahead for the recovery of the economy he says in this article on the BBC site. Somewhere in the news the other day the same bank was saying there are headwinds ahead, but the bank fully expects things to ease up, especially into next year. Phew! There is light at the end of the tunnel then. Today we have this article published by the BBC, reflecting the ‘anger by motorist’s at the price of petrol’. Well surely this has been a concern since rising petrol prices, which affect all goods and services, has been a contributor to the inflation we’ve seen in the high street. What goods are not moved by road transport these days? But looking further into the “anger by motorists” the report goes on to say on the 1st January 2012 there is already scheduled a 3.6p per liter duty rise. 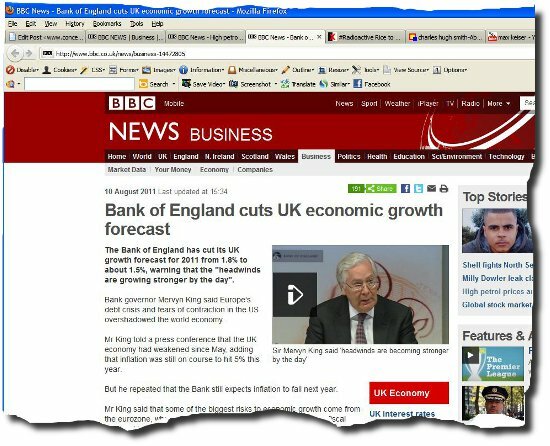 Then in August 2012 there is another scheduled rise of the rate of inflation, or, rate of inflation plus 1p depending on the price of oil. Either way its hard to see a decline in the price of petrol at the pumps. Either it will stay up and go up or it will go up. Presuming that all goods and services depend on oil to get delivered, there is going to be no let up in inflation either then. As the BOE has consistently forecast that inflation is soon to fall, its only temporary and they have been doing this consistently for almost three years and been consistently wrong for two and half of those three, remember its a 2% inflation target currently running at nearly 5%, oh go on Merv, I’ll believe you. Like your report I was born yesterday too.